There’s one situation when Mercury can be seen quite easily through a telescope, and that’s during a transit – when it passes in front of the Sun (advance notice to astronomical enthusiasts: there’s a Mercury transit coming up in a year’s time, on 11 Nov 2019). The trick is knowing exactly when to look – and that’s easy, because planets move as predictably as clockwork, don’t they? Well, not in the case of Mercury – at least not in the 18th and 19th centuries, when several transits were observed at the ‘wrong’ time, or missed altogether. The problem (as we now know) is that Mercury obeys Einstein’s rules of gravity, not the Newtonian approximation that was in use in those days. The inability of Earthbound telescopes to discern surface features on Mercury – despite various 19th and 20th century claims to have done so – is highlighted by the fact that no one knew what the planet’s rotation speed was until it was measured by radar in 1965. The answer is 58.65 days, exactly two thirds of the Mercurian year of 88 days. That means the days on Mercury are very long – even longer than you might think. The 58-day period is relative to an inertial frame, but during that time Mercury is also going round the Sun. So a ‘day’ (the time from one sunrise to the next) is actually closer to two Mercurian years. The final demystification of Mercury came with the first space probes – the Mariner 10 flyby in 1974 followed by the Messenger orbiter, which circled the planet for four years starting in 2011. Although they produced a wealth of data, their main achievement was to confirm Mercury’s status as ‘least interesting planet’ – a small, airless, heavily cratered world that resembles the Moon more than it does any of the other planets. There’s one small consolation in the fact that all those craters needed names, and aficionados of high culture can have great fun browsing through the list at the end of the book (there’s Magritte, Melville, Mendelssohn, Michelangelo, Milton, Monet and Mozart, just to mention some of the Ms). It’s not all bad news, though – Mercury has a few genuinely unusual and unexpected features. It’s made up of 60 per cent iron – an amazingly high proportion, twice that of our own planet. And it has a faint comet-like tail – something I was unaware of till I read this book. As I said at the start, Sheehan has done a great job of pulling together all the genuinely interesting facts about Mercury – in a serious, well-sourced style that’s easy to read without talking down to the reader – while resisting the temptation to pad the text out with unnecessary details. 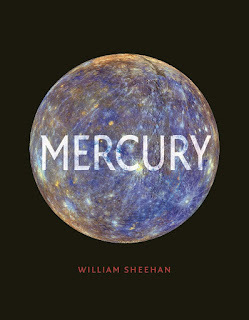 Add to that top-quality production standards and some lovely photographs from the Mariner and Messenger missions, and the result is a book that easily convinced me the Solar System’s ‘least interesting’ planet is still a pretty fascinating place.